The speed of light is very, very fast. In the span of a heartbeat light can travel from New York to London and back 25 times. So you can imagine how challenging it can be to measure the speed of light. We’re now able to measure the speed of light extremely accurately. So accurately that in 1983 we defined the speed of light so that it is used to measure the length of a meter rather than the other way around. But imagine trying to measure the speed of light in the 1600s. The problem of course is that if you want to measure the travel time of light, you need it to make a pretty long journey, and line of sight on the Earth isn’t far enough for 1600s science. You need an astronomical observation. 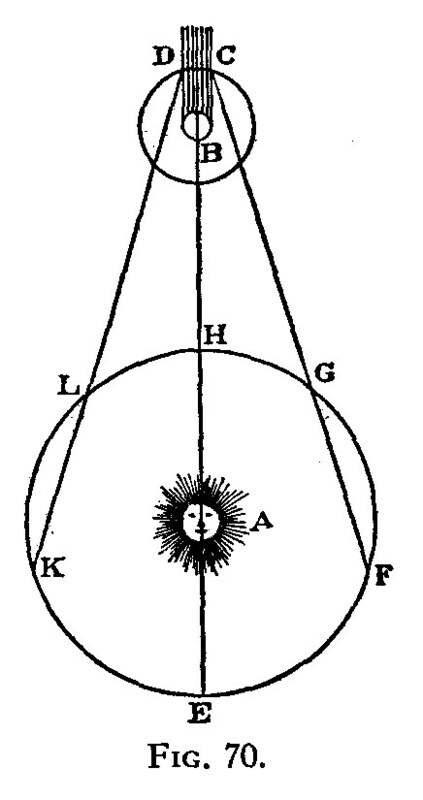 In 1676 Olaf Roemer made just such a measurement, and successfully demonstrated that the speed of light was indeed finite. In his paper (pdf here) Roemer outlined his method, which relied on making careful observations of Jupiter’s moon Io. Io is the Galilean moon closest to Jupiter, and its orbit is aligned so that it falls into Jupiter’s shadow as it moves behind the planet. This means that there is a clear point where Io “goes dark” as it moves into the shadow (immersion), and “lights up” when it comes out of the shadow (emergence). These points can be clearly observed in a telescope, so they provide a good way to time the orbit of Io. The moons of Jupiter orbit the planet just as the planets of our solar system orbit the Sun. Thus, like the planets, the moons follow Kepler’s laws of motion. So the orbital of Io should be pretty consistent. Roemer made measurements of the emergence and immersion of Io at different times of the year, when Earth and Jupiter were at different distances from each other. What he found was that the times of the emergence and immersions varied with the distance of Earth from Jupiter, and calculated that the time for light to travel half the diameter of Earth’s orbit was about 10 – 11 minutes. We now know it is closer to 8 minutes. Roemer’s demonstration of the finite speed of light was not universally accepted. There were some astronomers who thought light travelled instantaneously. It took the observation of stellar aberration to convince some astronomers. Paper: “Démonstration touchant le mouvement de la lumière trouvé par M. Roemer de l’Académie des Sciences.” Journal des Scavans. 7 December 1676.